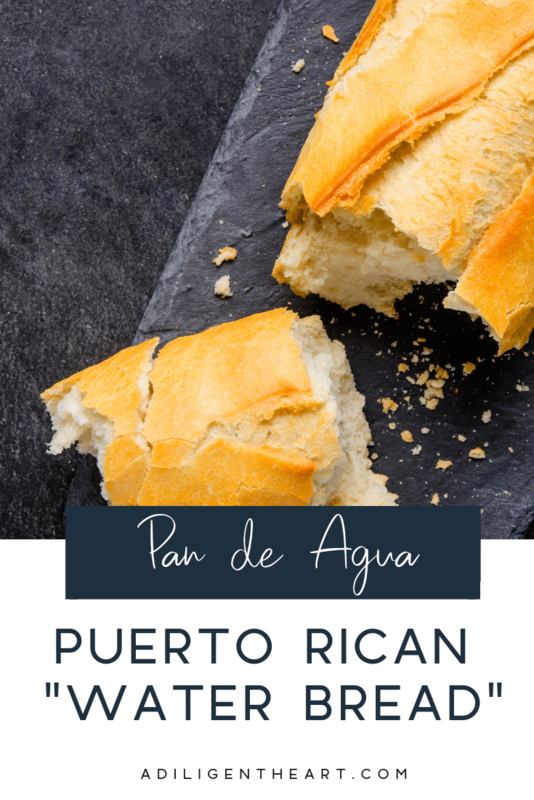 One of my favorite breads to eat from back home (Puerto Rico) is Pan de Auga. 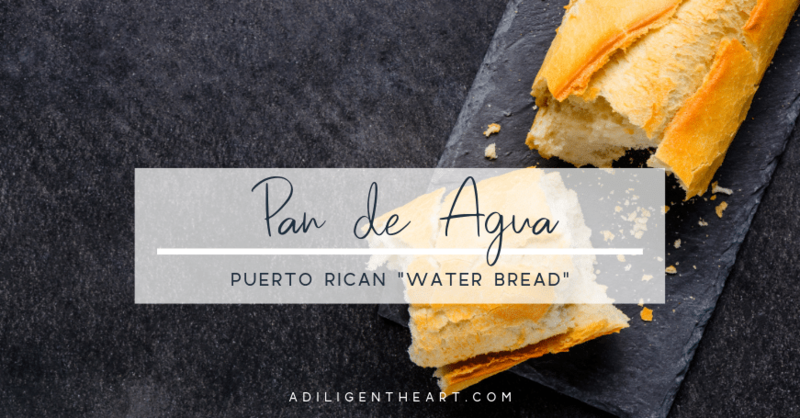 Literally translated: “bread of water” or “water bread” but that’s not really how you would refer to it. It’s super easy to make as long as you stick to the exact measurements. When it comes to the flour and kneading you want to use the same pre-measured flour to dust your surface first so that you avoid adding too much extra flour, should you need it. I’ve included tips with most of the steps sharing which are things I do that help me to ensure the recipe comes out perfect each time. Mix flour and salt together and set aside. A tip with the flour: Don’t pack it into the measuring cup. Just spoon it in and level it off. When it comes time to knead the dough, as you are kneading, just add a bit more flour to your hands (and some to the counter) if it becomes too sticky. This way you’ll know you are using just the right amount of flour. In a separate bowl mix sugar, water and yeast, and let stand for 20 min (with a towel over the top of the bowl). Your yeast will get a bit foamy, this is how you know it’s good. Also, the warm water should be a tad bit warmer than a baby’s bottle. So you really want warm-hot water. Not so hot that you can’t touch though. Tip with the towel: dampen it with warm water and really ring it out so that there is no drip. You just want it a bit damp. You can even just dampen a part of the towel, not the whole thing. Then use this as your towel to place over the dough. Once you’ve left the yeast/water/sugar to sit for 20 min, covered with a towel, you can now start adding your dry ingredients one cup at a time. Stir it together each time you add more. Once you have about ¾ of a cup left (or a little less because it still may be too sticky at this point) you can dust the counter with a little flour (just take some from the dry ingredients bowl you mixed so that you use this up first) and start kneading the dough. You need to knead for about 8-10 minutes. I always do 10, and it works out great. Slowly add the rest of the flour mixture to the counter and/or the actual dough while you are kneading, until all the flour is used up and 10 min has passed. If the dough gets sticky, and you run out of the flour/salt mixture – just grab a bit more flour and dust the counter and your hands. That should be enough. Repeat this until the full time has passed. Place the kneaded dough in a greased bowl (I usually have my daughter clean out the bigger bowl I used and dry it off real good, and spread some butter on it while I’m kneading the dough.). Be sure the bowl is deeper than the dough a the dough will expand to about 3 times it’s size. Cover the bowl with the dough in it and let it rise for 2 hrs. You can use the same tip from 2 with the warm damp cloth for this part too if you’d like: dampen it with warm water and really ring it out so that there is no drip. You just want it a bit damp. You can even just dampen a part of the towel, not the whole thing. Then use this as your towel to place over the dough. When it’s done, sprinkle just a bit of fresh flour on the counter and dump your dough on it. The part that was touching the bowl should be a bit sticky, this is how you’ll know that you’ve done everything right. Next, take a knife and cut the dough in half. Form two long loaves and place in a non-stick-sprayed baking sheet with cornmeal (or flour) sprinkled on it. You can also use parchment paper that is just sprinkled with cornmeal. Parchment paper doesn’t stick, so I find that if I have this I favor it more than a simple pan with non-stick spray. Take a sharp knife, and cut slits all across the top of the loaves. Grab your whisked egg white and tbs. of water and brush it over the loaves (I don’t always have a brush accessible so using your hands is just fine! ) . 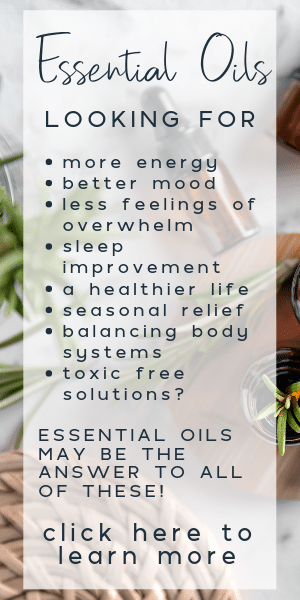 You do not have to use all of the mix. You will probably have lots left over. Once all this is done, boil a little over a cup of water (about 1 ¼ cup). Place loaves the middle of the oven. On the bottom rack place a shallow pan with the boiling water. I just boil the water in my small cast iron skillet since it can be used in the oven too. Depending on how you like your bread you may want to store it differently. I like my Pan de Agua to get a bit “crunchy” so I leave about half a loaf out on a dish. But the rest of the bread I leave covered because it keeps it a bit softer (my husband prefers his that way). It was a tradition in our family to have this bread Sunday mornings with some coffee. 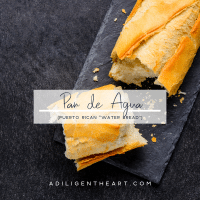 My Grandfather would go every Sunday morning up to the panaderia to grab a loaf of pan de agua and pick up the Sunday newspaper for my Grandmother. Hope you guys enjoy this as much as our family does! 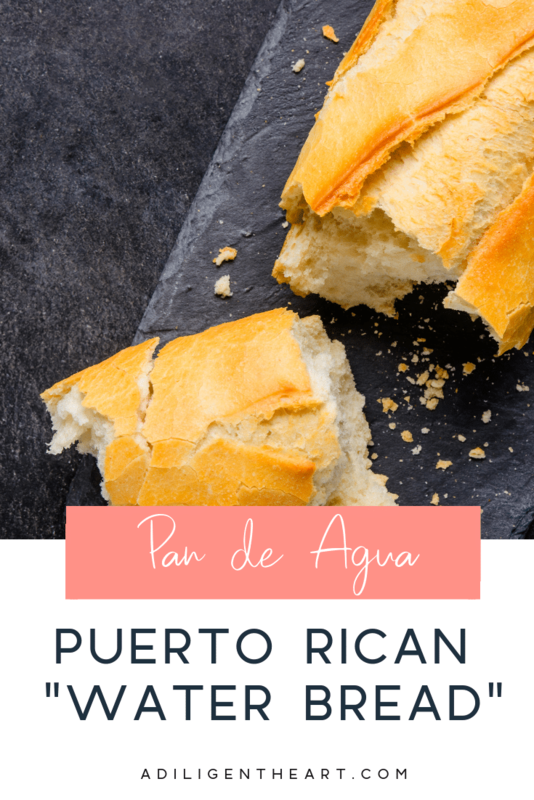 Delicious Pan de Agua - a Puerto Rican staple. Turn your oven on 400 degrees and bake for 35 min. DO NOT pre-heat your oven. Just turn it on once all it in there. Hola!!! :) I’m so glad you found me!!! let me know how it comes out for sure!! :) A tip with the flour: Don’t pack it into the measuring cup. Just spoon it in and level it off. As you are kneading, just add a bit more flour to your hands (and some to the counter) if it becomes too sticky. This way you’ll know you are using just the right amount of flour. :) I just made a few loaves today!! Super RICO!!!! Buen Provecho!! Gracias Marlene. Pronto haré la receta y te dejaré saber cómo me salió. Nunca he tenido mucho éxito haciendo panes, pero voy a intentar nuevamente a ver si me sale. Can I do this recipe with gluten free flour? Thank you so much for trying . My daughter in law has Crohn’s Disease and also has gluten intolerance andshe loves puertorican bread.